1/2 AA Lithium Thionyl Chloride battery, Equivalent to Tadiran TL-5101, Saft LS-14250, Saft LS-14250C, Sonnenschein SL-350/S etc. Type: Lithium thionyl chloride (LiSOCl2). Voltage: 3.6 V.
Price: £5.10 each. £4.90 each if you buy two or more. Postage and packing included. Can replace 1/2 AA size batteries such as: Tadiran TL-5902, Tadiran TL-2150, Tadiran TL-5151, Tadiran TL-4902, Tadiran TL-5101, Tadiran TL-5111, Saft LS-14250, Saft LS-14250C, Sonnenschein SL-350/S, Sonnenschein SL-750/S, Sonnenschein SL-150/S, Maxell ER3S, Maxell ER3S-TC, Minamoto ER14250. 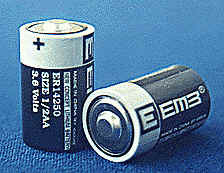 This 1/2 AA Lithium Thionyl Chloride battery is ideal for wireless alarm systems such as the MCPIR-3000, memory backup for computers like the Apple Macintosh (Parameter Random Access Memory, Parameter RAM, or just PRAM), high tech Suunto dive computers, some Aladin Dive Computers, most ITI, Radionics, ADT Alarm Transmitters and DogWatch 3000 Invisible Fence Systems. With such a long shelf life, why not buy two or more packs, take advantage of our reduced price and make sure you are not left in the lurch next time your battery runs out. Visit here if you need the version of this cell with solder pins. Visit here if you need the version of this cell with solder tags. Visit here if you need the version of this cell with axial wires. Visit here if you need the version of this cell with polarized solder pins.